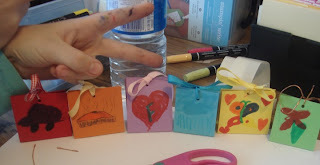 As promised, here is some of the projects that we'll be doing tonight at the "Carte Postale" Stamp camp. 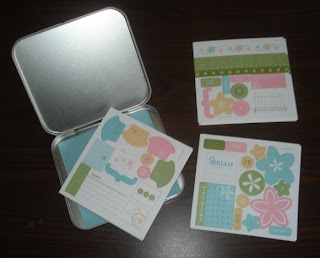 I had received this Winter Mini set back in September, when I was at Stampin' Up! 's Founder's Circle retreat, and I just fell madly in love with it! When the mini was released and I saw it also had a matching jumbo wheel, background stamp AND background papers...well didn't I just think I'd died and gone to heaven??! 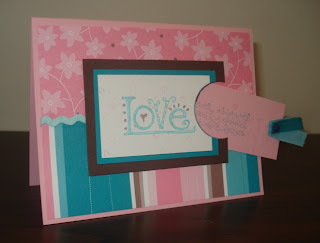 For this first project, I was heavily inspired by my downline Lisa's card (visit her blog or her SCS gallery, they're great!). This is a pretty simple donut card (you know, with a hole in the middle?). 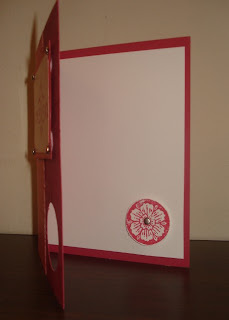 The small circle area is actually cut out and lifted with Stampin' Dimensionals so that it is slightly raised through the circle punch when the card is closed. 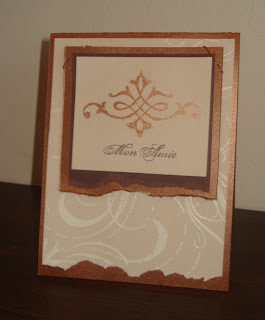 The second card uses the Brushed Copper paper (love it), vanilla embossing powder, copper cord and matching Pearl-ex...something we played with at this month's Stampers Club. 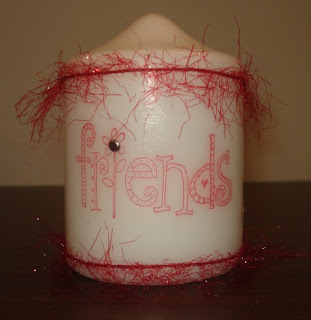 Did you know that "Mon Amie" means "My friend" in French? What a great card to send to a special girlfriend you haven't seen in a while. 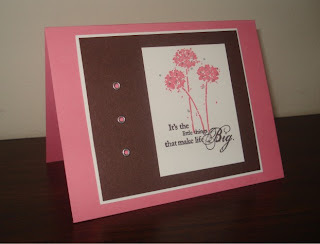 If you are interested in learning more about tonight's class, click HERE to visit my Stampin' Up! website where you'll find all the details! 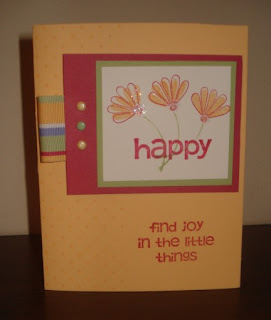 When I participated in the SAB Mega Swap last December, I got a really cute "Delight in Life" card from Pam Lee, another talented Canadian demonstrator (her cards always insire me!). Since I didn't have the "Seaside" ribbon she used on her card & needed to use the "Sweet Shop" instead, I changed her colour scheme from blue & brown to apricot & rose, and switched stamp sets around as well. 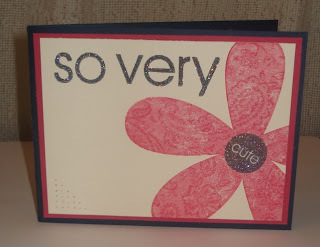 Instead, this card uses the wonderful "Polka Dots & Paisley" set that all demonstrators received FREE from Stampin' Up! these past months. It'll be available for sale next month in the new Spring mini catalogue, as well as part of a great promotion called "Spring Fever". Sound exciting? You bet! Sign up for my newsletter (on the left) and find out all about upcoming promotions, as well as get stamping tips, info on my classes & events, etc. 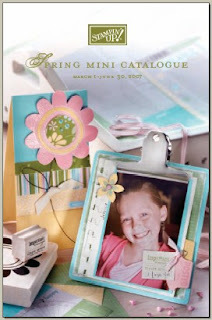 Isn't it almost time to start stalking the postman for your copy of the new Spring Mini Catalogue? You're going to love it!! If you live in Canada and would like to receive your own copy, please drop me an email at caroline@canadiansink.ca and I'll be happy to add you to my snail-mail list! 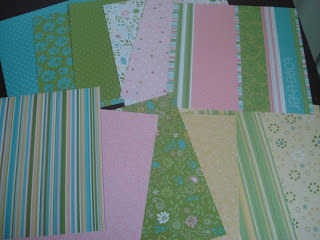 Notebooks + Spring Mini Papers & Spiral Punch! I also NEEDED to get the cute little On Board Art Journal (5"x5" and seen here with a package of beads, so you can get a sense of its size). 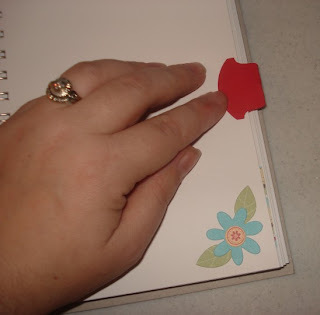 Wait until you hear about the new Spiral punch that will let you HOLEPUNCH paper and cardstock to make covers and additional pages. And you will... further down! 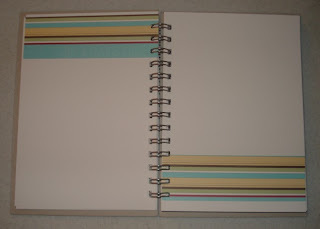 and the Long Notes (seen here in Cool Carribean), which are 6 5/8 x 3 1/4". Okay...so more about those new PUNCHES!!! 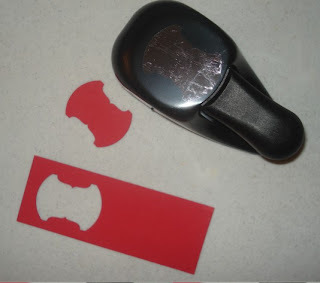 As I mentioned, there is a new Spiral punch. 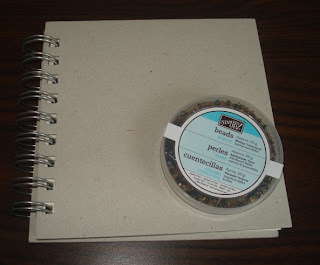 I played with this one first as I had one of the larger Art Journals that I had been wanted to decorate for ages. My idea was to create a Cruise Journal, that I could bring on the ship with me in April to jot all my notes & experiences down first-hand, leaving rooms for the occasional picture. 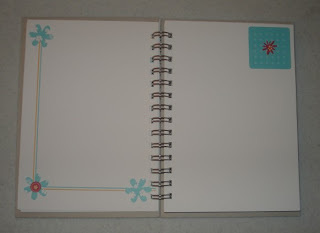 I didn't want it to replace my normal scrapbook, just be in addition to it! I decided to go with the "Friends & Flowers" Simply Scrapping Hostess kit as my inspiration, and cut a sheet of the patterned paper to fit my cover. 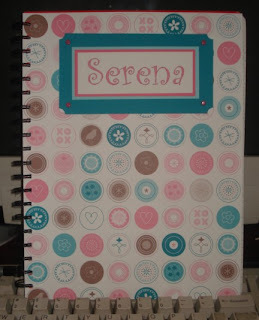 I used the spiral holepunch to punch holes down the side, and decorated the cover with the adhesive elements. 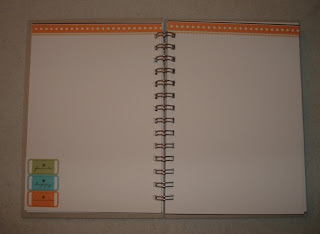 FYI, the title reads "happy favorite memories"
Once my journal is finished, I plan on then creating custom tabs to separate the different areas of my writing, like "Pre-Cruise", "Aruba", etc. You just fold the tab in half and adhere! You can embellish them any way you want, of course, and believe me... I will! 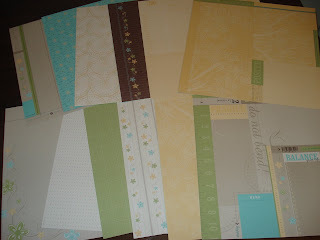 I wanted to check if the Spiral punch worked on other types of journals and not just the Stampin' Up! 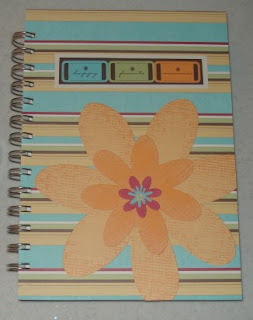 ones, so I hit my local Dollarama and picked up a notebook to decorate for my daughter. It was ridiculously easy! 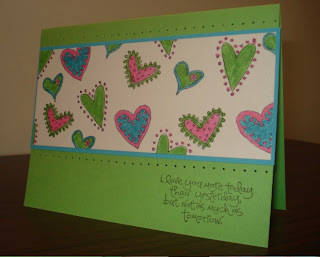 I kept it pretty simple just by using the "Loves Me" paper from the current Winter mini catalogue, some cardstock & brads. She loved it!! You might have noticed that there are new sets in my recent order, and you'd be right. But DON'T be thinking that's because there aren't any "must-have" sets in the new mini, since you'd be dead wrong! This is just me practicing extreme restraint and having to wait until March 15 when I can order them ALL! 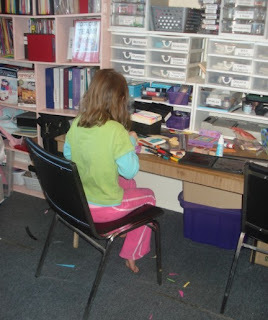 You see, I earned *14 FREE SETS* through Stampin' Up! during the past 2 months and I get to redeem my choices on the 15h...so I'm cleaning out the Spring Mini and getting whatever my little heart desires. WOOOOHOOO -- how stinkin' awesome is that?!! 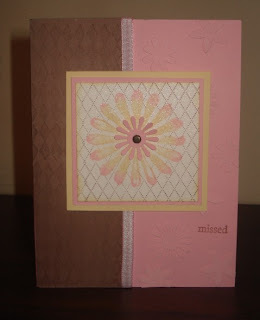 Stay tuned this week to see cards from the upcoming "Carte Postal" Stamp camp and using the new "Polka Dots & Paisley". Ahhh, can you feeeeel the luuuuuuuv? 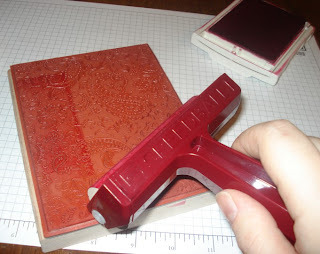 It's TIME to get SMOOCHING, stamping-style! 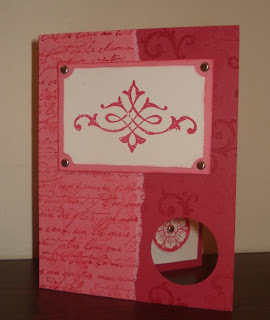 Valentine's Day might already be history, but the stamping luvvvvvvvvv remains (and since I found my camera's battery charger, I can finally post the tutorial as promised). We incorporated kissing at my latest Stamp Club meeting using the Big Blossom SAB set + the Paisley background...well, all except for Miss Cheryl, who despises paisley with the heat of a thousand burning suns. 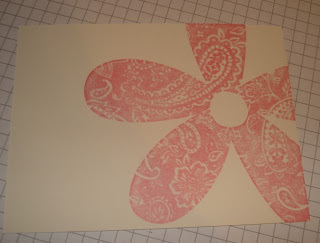 First I inked up my brayer with Rose Red ink and thoroughly covered the Paisley background with it. 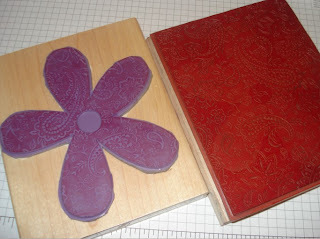 Leaving the paisley rubber-side up, I took the uninked flower and pressed the 2 stamps together (*smoooooch*). 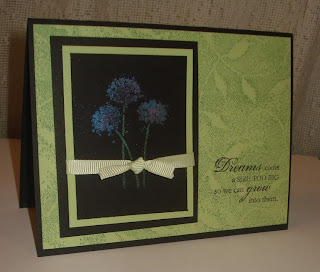 Here's a completed card using the Big Blossom kissed with the paisley: while you can't really see it in the scan, we used Night of Navy Craft ink with Heat'n'stick powder and Dazzling Diamonds glitter for some extra bling! 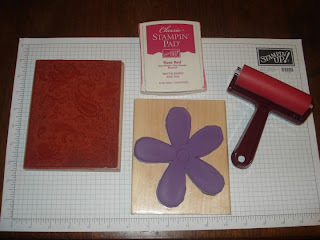 For more information on the classes and Stampers Club's I offer, please visit my official Stampin' Up! website HERE. 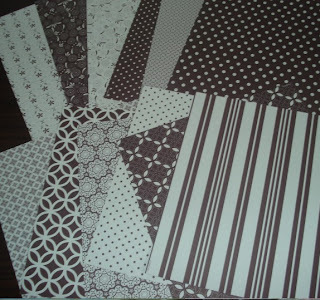 Many of you may have seen UHU reviews popping up on your favourite papercrafting blogs in the past few months. 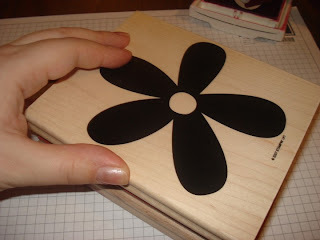 At least, that's where I first read about Maria Filosa’s UHU Project Blog, and thought I'd like to participate as well. The idea is that if you are a craft blogger and would like to try out some of UHU’s products, they will send you some and you simply give an honest review on your blog. Sounds easy, eh? 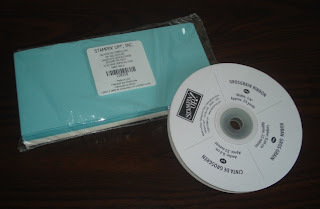 I made my request a little while ago and am looking forward to receiving my new adhesives to try! 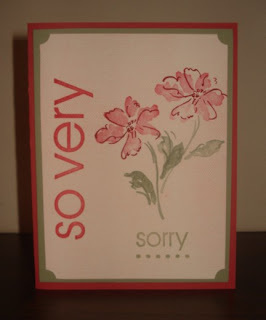 Much as I love my Stampin' Up! tools, I'm always willing and eager to see what else is available in the crafting market. 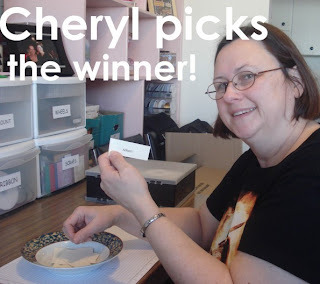 Cheryl (my Stampin' Slave, as she is so affectionately known) drew the name out of a bowl of everyone who participated in my Top 5 Stampin' Investments contest. I'm happy to say that Allison is the winner this month -- congrats to you! 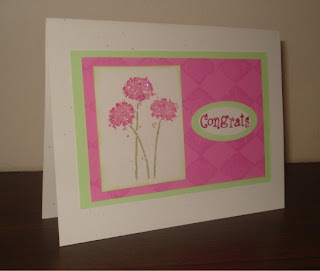 She won a new & unmounted "Bloomin' With Happiness" Level one Hostess set from the current Stampin' Up! 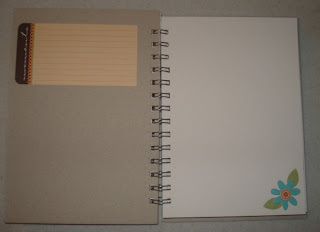 Idea book & Catalogue. 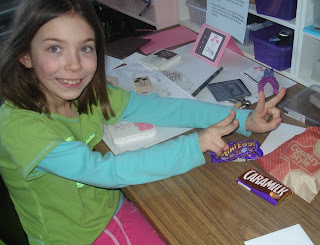 I'll be having another Blog Candy contest starting next week, so be sure to check back in! My "Card of the Week" program starts this weekend so if you haven't already signed up for it, you can do so HERE. 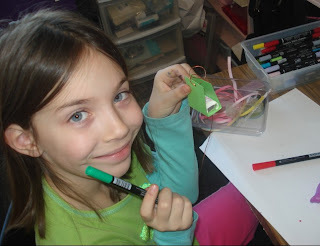 February's e-newsletter is slated to go out on Tuesday so watch your Inbox for that one.